WASHINGTON — Mitt Romney told several donors on Friday that he’s seriously considering a third run for the White House, a change for the 2012 GOP nominee after months of insisting his career in politics is over. 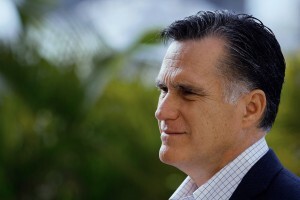 Romney, who ran unsuccessfully for president in 2008 and 2012, has repeatedly insisted he would not run again. Both spoke under condition of anonymity, because they were not authorized to speak publicly about the private discussions. The meeting was first reported by The Wall Street Journal. The news from Romney comes as former Florida Gov. Jeb Bush marches swiftly toward a 2016 bid of his own, which threatens to win much of the support from the Republican establishment that fueled Romney’s last campaign. Some donors who gave to Romney have already privately committed to Bush, who has spent recent weeks hosting private fundraising meetings across the country. In addition to Johnson, Friday’s meeting with Romney included Emil Henry Jr., an assistant treasury secretary in Bush administration; Alexander Navab, of the financial firm KKR; Patrick Durkin, a managing director at Barclays; Clifford Sobel, managing partner of Valor Capital Group; and Edward C. Forst, CEO at Cushman & Wakefield. “We’ll get someone who can win,” he added.